A broken heart can happen when we lose a loved one such as a spouse or a child or even a beloved pet. Metaphorically, it is that emotional aching in your chest that happens when you are deeply disappointed or grieved over a life circumstance. 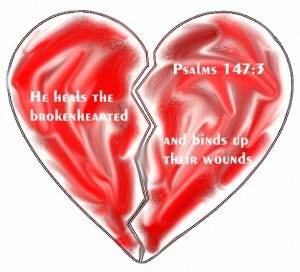 The Bible has many other verses that can encourage the brokenhearted as well. Here are just twenty encouraging Bible verses for the brokenhearted that I found. Isaiah 43:18 Remember not the former things, nor consider the things of old. God promises can take time to come to fruition. 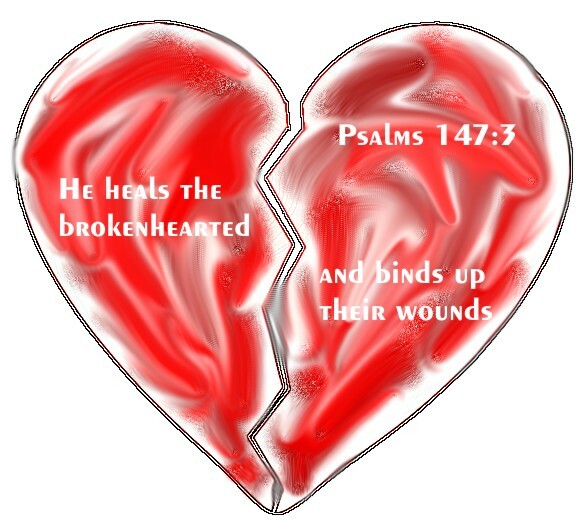 God does heal the brokenheart. Not ease, but truly HEALS. I accepted Jesus after age 30 while still suffering from bad depression. My depression began from a failed relationship that occurred in my early 20s and I had so many regrets. I tried so many ways to get over it, without much success. Suicide was often in my mind all the years. The first 2 years as a christian, I spent a lot of time understanding repentance and putting it into practice. God impressed upon me that sins will hinder prayer and that I need help from from the Holy Spirit. After I turned 32, my depression disappeared and I am not quite sure when exactly it left me. I also lay my regrets to rest. I attributed it as an affirmation of a healed broken heart. I am in the stage of depression because of lose very loved one. We are working in the same company and it is so hard for me to get over with it because we really could see each other everyday. I am trying to avoid him or him towards me but it is hurting. I’ve tried to talk to him but it seems I’ve worsen the gap within us. I am trying to accept everything. Trying to move on but still so hard. I’ve read these verses and is very comforting. But the pain & fear of not moving on is there since I still could see him. Is there a certain bible verse for that? I know He is there but I stil feel so small. Give me tips how to overcome this. Hi jack. Our company has only one ministry. The activities are worship every Sunday, prayer meeting & visiting prison every week. Yeah I join the activities. Thank you for your words I am Angela anyway. Ive read bible these past few months every night but was stopped & now very seldom. Ive already read d whole book of John before. Yes I will visit them again. I am working, is there online ministry activities that I could join? I am working now & my time for other activities is limited. If there is ministry activities just like this I am willing to join. If dont have I will take your advise. Thank you so much. How about my situation? I am a born again christian and God has a special favor for me in love life because the precious gift of God for me never be my partner because she never likes me, but why until now I still experience busted and rejected on early girl that I liked and favored by God? The fact on me also is I am 100x busted by girls seens 1st year high school. WHAT I EXPECT NOW IN LIFE? Spirit of disapointments in relationship has been following me for more than 14 years been prayed for.no relationship seem to work for me..always alone…i have been to so many delivarence services..still u feel alone not loved until today.im si worried..hurt..miserable…confusee not knowing what to do…pls help me. What are these “deliverance services” Val? It doesn’t sound like it comes from the Bible. As for being alone, is your church too small in membership? Don’t give up. If you do, you can spiral ever downward. I know I will pray for you and I am sure others will who read this. If you make Christ the number one priority and His kingdom, He will provide everything you need (Matt 6:33). That doesn’t mean a spouse, but if your desire is first upon Him, He may grant you your own desires of the heart. Praying for you Val. I been rejected, used and basically milked. Now that I’ve been drained the other person is gone on with someone else leaving me feeling heartbroken. I am at place where i want my heart to be mended and to be where i can go on without this void in my life. God always has something better in mind. Even if other people don’t treat you the way they should, know that there is a God who sees you as a precious commodity. And he always brings better people into our lives. After going through the biggest heartbreak I’ve ever experienced, I found the person who was really right for me. Time really does heal all wounds. And I hope you see yourself the way God does, because you are deserving of much more. Remember God’s love is always here for you. Feeling very sad lately…. A guy I was dating decided to get back with his ex. He couldn’t even tell me…..instead she did. I was very hurt and confused to know that he was talking to someone else about my personal life. I couldn’t believe what I was hearing from a complete stranger. I thought we were exclusive but he was lying to me. I’m still hurting. I can’t wait to get over this…. Feels like I’m grieving. my mother is battling cancer and I’m scared to lose her. I know it will happen but I can slowly see God calling her. I’m so heartbroken. My fiancé broke up with me and won’t speak to me or let me see him. I’m lost without him and need him in my life. He told me we will never get back together and I need to move on. He called me terrible names and said he would have me arrested if I came near him. I’ve done nothing wrong, I only asked for some money back that he stole from me and all this happened. i hurt the woman i love emotionally. i am a manipulator by nature. weve been together for 3yrs with long distance relationship. we manage to be loyal to each other she asked for a space from me i know that she stills loves me but shes dating another guy who can give her physical attention and a stress free life. im so broken cause i love her so much. and i cant stand seeing her with another guy. i dont want to loose her and i hate seeing her lying so she wont hurt me. and i still want to fight for her cause i knew in my heart that she loves me.